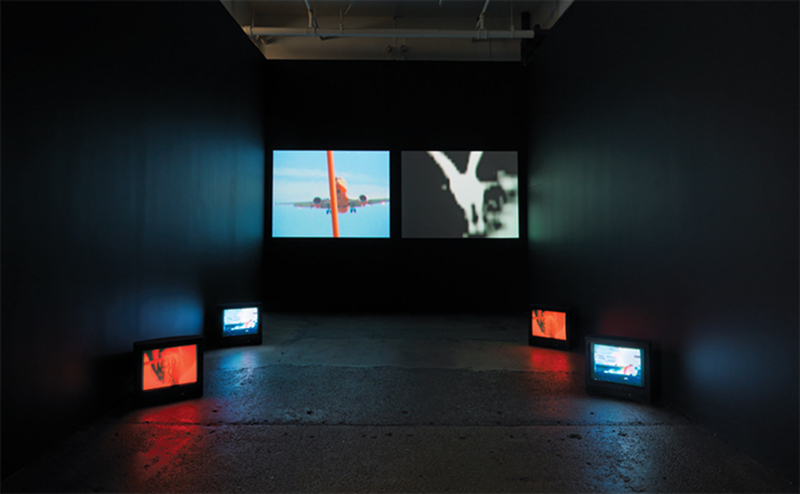 Carolee Schneemann, Devour, 2003–2004, multichannel video, color, sound, 3 minutes 37 seconds. Installation view. Galerie Lelong. What does an enduring commitment to feminist antiwar resistance look like? For more than five decades, Carolee Schneemann has underwritten her art with a desire to understand and observe. From Viet-Flakes, 1965, and Snows, 1967, which protested the Vietnam War, to the “Lebanon Series,” 1983–91, on the destruction of Beirut, and Terminal Velocity, 2001–2005, wherein she took on 9/11, she has long borne witness to cruelty and empathy, though discussions of her oeuvre sideline this theme in favor of other, related issues of gender and sexuality. Hot on the heels of her retrospective at the Museum der Moderne Salzburg in Austria, Schneemann’s two-part exhibition this past fall offered lesser-known yet no-less-poignant examples of her ongoing mode of defiance.